Nightsiders are a coalition of races from the Dark Nebula 5 million light years from Earth. This region has very little solar radiation (or light for that matter). During Earth's middle ages, a Super Namek named Lord Slug arrived in the Nebula. On arrival he used his powers to unite the various alien races of the Nebula into a coallition known as the Nightsiders. Lord Slug then used them to build fleets of starships to plunder the resources of other planets through terrafreezing. In the 1980s (Terran Years) the aged Lord Slug (ancient by Namek standards) then decided to conquer the inhabited planets of the Sol system in the Milky Way galaxy. 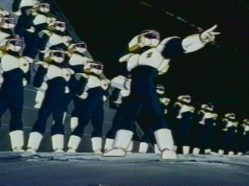 He took his fleet's flagship and his personal bodyguards along with some of his best shocktroops to conquer Earth. Lord Slug's Nightsider conquest of Earth was thwarted by the efforts of the Z-Team and Lord Slug and his entourage were slain. Without the leadership of Lord Slug, the Nightsiders are in a state of civil war. The various planets of the Dark Nebula are now ruled by warlords. Nightsider technology was that of Europe's Middle Ages prior to Lord Slug's arrival. After the Super Namek took control of the Dark Nebula, Nightsiders had stardrive and the use of planetary terra-freezing/forming technology. Health: 32 Karma: 22 Resources: Pr(4)/Rm(30) on their homeworld. Popularity: -10 on Earth, 0 elsewhere. Abnormal Sensitivity: Nightsiders can see infra-red and ultra-violet light. They can also have the equivalent of Rm(30) night-vision. Weakness: Nightsiders are sensitive to light, especially sunlight. Their aversion to sunlight is such that they are -2CS on all stats and powers for as long as they are directly exposed to sunlight. They suffer a -1CS to indirect exposure to sunlight. Their stats return to normal once out of sunlight. Contacts: Dark Nebula(Home System, CL1000 Resources), Lord Slug(Leader, deceased).